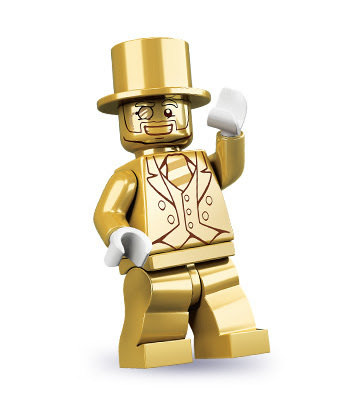 "Rumor has it that somewhere out there is a very special Minifigure known as Mr. Gold. Shining and golden from the top of his tall top hat to the tips of his toes, he may be discovered in all sorts of unexpected places, but he never seems to turn up exactly when and where you’re looking for him. According to legend, Mr. Gold will bring you luck if you happen to spot him…or is it that you’ll need to have a lot of luck to find him? Either way, everybody wants to find the mysterious Golden Minifigure – but only a fortunate few will succeed!"